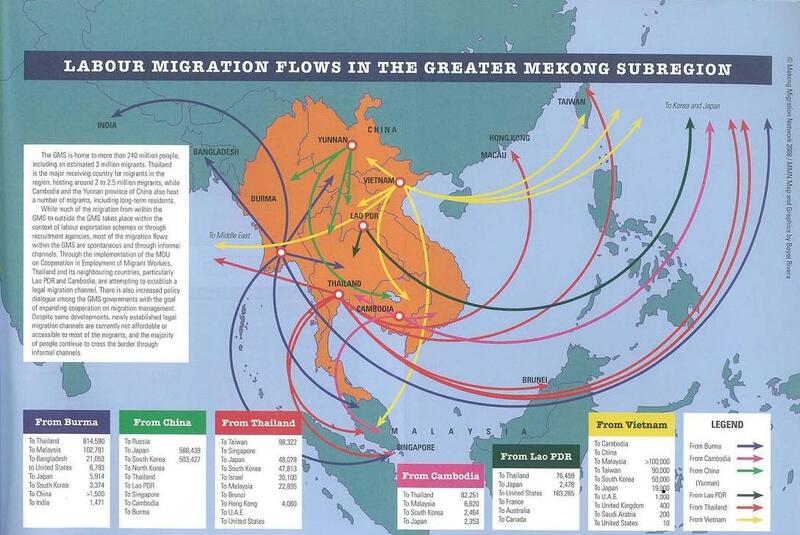 The Greater Mekong Subregion (GMS) is home to more than 240 million people, including an estimated 3 million migrants. Thailand is the major receiving country for migrants in the region, hosting around 2-2.5 million migrants while Cambodia and the Yunnan province of China also host a number of migrants1. Accurate data concerning the number of migrants in the GMS is hard to come by. This is due to the fact that many migrants are long term residents in their host country (as illustrated in the case of Vietnamese migrants in Cambodia), and most migration in the region is spontaneous and through irregular channels. Furthermore, many people in the GMS are not documented in their home countries. In Cambodia, for example, estimates regarding the number of migrants vary between 150,000 to more than 1 million. It is also important to note that the ethnic groups residing along the borders are often related to people on the other side of the border who belong to the same ethnic nationality and therefore the movement across the borders has long been a part of their daily lives. Up to the latter half of the twentieth century, many of the countries in the GMS were embroiled in internal strife, repressive regimes, cross-border conflicts, recurring political instability and associated economic difficulties. In the 1960s to 1980s, migrants from the GMS were mostly refugees fleeing wars and repressive regimes. Around 250,000 Vietnamese people fled during the Vietnam-USA War, and hundreds of thousands of Vietnamese fled the country as the “Boat People” after the war. A large number of Vietnamese people also went to Cambodia during and after the conflict between Vietnam and Cambodia. In Thailand, large number of Laotian refugees and migrants began arriving as early as 1975. The number of Burmese refugees has increased since 1984 and further accelerated after September 1988 when the uprising demanding democracy was quashed by the military regime. In the 1990s, the population movements became a mix of refugees and labour migration. Thailand’s economy saw rapid economic growth particularly between 1990 and 1995. This strong economic growth resulted in a higher demand for labour, attracting large number of workers from rural areas across Thailand, as well as from neighbouring countries. Undocumented migrant workers became a significant feature of the Thai economy and society. In 1992, the Thai government introduced a scheme to register migrants who were working illegally in the country. However, this registration scheme was only open to Burmese migrants and only in certain provinces mostly bordering Burma. Less than 10,000 workers registered for the scheme. In 1996, the first written policy appeared through a Cabinet resolution providing work permits to undocumented migrants. This practice of periodically issuing Cabinet resolutions has become the government’s standard procedure in shaping its policy and practice on migration in Thailand. The features of this scheme have changed constantly from year to year, depending on the economic situation and political temper. In 2005, a total of 871,170 migrants registered through the regular registration process (a temporary migrant workers card valid from July 2005-June 2006). In March 2006, a total of 220,892 migrants registered through the interim registration policy (card valid from March 2006-February 2007)2. The number of migrants who registered in these two periods was then 1,092,062. In July 2006, a total 668,576 migrants registered (card valid from July 2006-June 2007) and in March 2007, a total of 141,289 migrants registered (card valid from March 2007-February 2008). The total of migrants who registered in the two periods then dropped to 809,865. In July 2007, the number of migrants who registered further dropped. Only 394,443 migrant workers registered during this period (card valid from July 2007-June 2008). In addition, as of December 2007, 10,540 migrants registered in the Deep South and around 70,000 Cambodian and Laotian migrants received legal status through the MOU processes. The Yunnan province of China, sharing its border with Burma, Lao PDR and Vietnam, also has a long history of outward and inward migration. Though it was traditionally a sending area of migrants, the direction of the migration became two–way following the growth of China’s market economy and the normalisation of diplomatic relations with Burma, Lao PDR and Vietnam in the 1980s and 1990s, including the opening of its borders with these countries for trade and communication. Cambodia, as mentioned earlier, is home to an estimated 150,000 to 1.1 million migrants primarily from Vietnam. Many of the Vietnamese are long term residents who arrived in Cambodia during 1970s and 1980s. There is a lack of reliable data concerning these migrants in Cambodia. There also appears to be a lack of government policies in relations to the migrants in the country. Lao PDR, while being mainly a sending country of migrants to Thailand, it is also home to a small number of immigrants from neighbouring countries such as Vietnam and China. In Thailand, 1.28 million migrants registered in 2004. In addition, there are estimated 800,000 to 1.2 million unregistered migrants. In June 2005, 240,297 employers registered requesting 1,881,520 migrant workers. Thus, the number of migrants who registered for July 2005-June 2006 was far below the number of workers needed by the employers. In an attempt to fill this shortage, the Cabinet made a decision to open a new registration period in March 2006 to register a further 500,000 workers.